Gyoza is Japanese Style Dumpling. The most prominent differences of Japanese-style gyoza from Chinese style jiaozi are the rich garlic flavor, which is less noticeable in the Chinese version, and the fact that Japanese-style gyoza are very lightly flavored with salt, soy, and that the Gyoza wrappers are much thinner than the Chinese counterpart. They are usually served with soy-based tare sauce seasoned with rice vinegar and/or rayu in China, red chili pepper-flavored sesame oil). The most common recipe found in Japan is a mixture of minced pork, garlic, cabbage, and nira (Chinese chives), and sesame oil, which is then wrapped into thinly-rolled dough skins. In essence, gyoza are a cross between a pierogi and an egg roll.Gyoza can be found in supermarkets and restaurants throughout Japan. Pan-fried gyoza are sold as a side dish in almost all ramen and Chinese restaurants in Japan.The most popular preparation method is the pan-fried style called yaki-gyoza ( 焼き餃子) in Japan, in which the dumpling is first fried on one flat side, creating a crispy skin. Then, water is added and the pan sealed with a lid, until the upper part of the gyoza is steamed. 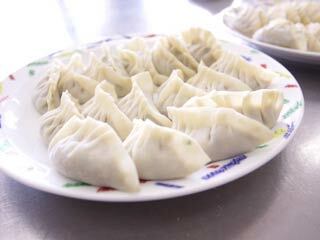 Other popular methods include boiled sui-gyoza ( 水餃子) and deep fried age-gyoza (揚げ餃子). Minced beef and pork. Cabbage, Garlic Chive, Garlic, Ginger, and Gyoza Skin. Goma Oil (Sesame oil), Soy Sauce, Sake, Salt & Pepper. Prepare a bigger bowl because we will mix all ingredients here. Fine-Chopping: Cabbage. Garlic Chive. Ginger. Garlic. Use Kitchen paper or towel to wring the water. Soy Sauce. Sake. Salt & Pepper. Sesame Oil. Mix them until they get sticky. Put a little Sesame Oil. Pour water, halfway top of Gyoza. Steam them until all water disappear. Add a little sesame oil.